If you’re a diver, you know why. 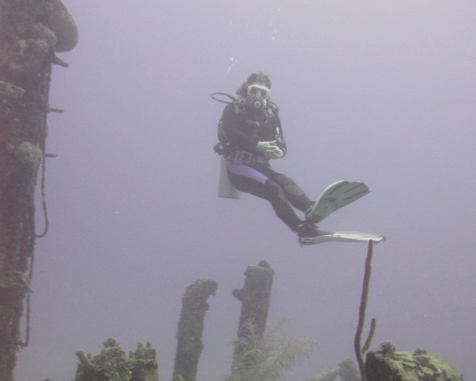 If you’re not a diver yet, let’s talk about why you should dive. Chances are that if you’re viewing this, you’re interested in diving. Maybe a friend told you about how cool it is. Or maybe you’ve seen one of the Drop Zone movies. Or maybe you’re old school and remember Jacques Cousteau or Sea Hunt and have always wanted to try it. Our planet is misnamed. Nearly three-quarters of the planet called Earth is actually covered in water. Divers get to explore that space. When diving, divers strive to be neutrally buoyant—weightless. NASA only accepts a handful of people to become astronauts, so short of being part of that incredibly small minority or paying a ton of money to become a space tourist, SCUBA is you can experience weightlessness. In fact, NASA actually trains astronauts in an aquatic environment at the Neutral Buoyancy Lab. In fact, the Neutral Buoyancy Lab is one of many places for professional divers to work. Maybe you’re not looking for work, so let’s focus on the adventure. It’s been said that SCUBA is ‘fun.’ SCUBA is more than fun. It’s an adventure. For those of us that walk on land, there are very few places that are unexplored—back to that lingering twenty-five percent of our planet’s surface. Underwater, there is a chance you can see something that no one, I repeat NO ONE, has ever seen before. In fact, several new species of aquatic organisms are discovered each year. SCUBA diving can be done pretty much wherever there is water. For example, I live in the second driest state in the US (by rainfall, not other metrics). We have a very active local diving community. BUT…SCUBA is your gateway to exotic travel. The Caribbean, central and southern America, the tropics, Japan, South China Sea or even oil drilling rigs off of southern California. You name it, the world is your oyster. 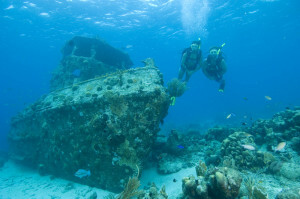 SCUBA divers travel the world over to see amazing things. Divers dive for amazing experiences like swimming with sharks (they’re not nearly as dangerous as you might believe) or to see historic ship wrecks. Some basic equipment of your own: mask, snorkel, fins and probably some boots and a mesh gear bag to hold it. If you want to go all out, contact your instructor first. He can advise you on what gear is appropriate for the diving you want to do. Also, many dive shops will let you try out gear before you buy it. Remember, you get what you pay for. SCUBA training teaches you how to use life support equipment in a hostile environment. Remember, human, you can’t breathe underwater. SCUBA equipment makes it possible, but you need to know how to do it safely. My next blog post will discuss the revised PADI Open Water Diver course, so stay tuned. *What’s PADI? PADI is the Professional Association of Diving Instructors. PADI Instructors around the world teach the vast majority of recreational scuba divers. I’m a PADI Course Director, meaning that I’m a PADI Instructor and an Instructor Trainer; I train new PADI SCUBA Instructors.